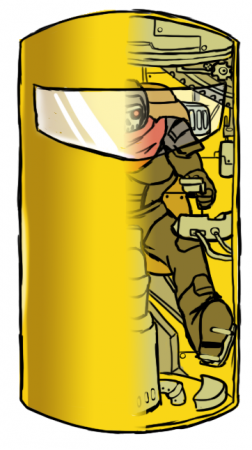 Here we have the Pillguy, a floating SkullPro piloted mechanical armor suit that strangely looks like a large yellow capsule with a white visor. Originally a placeholder enemy, used in the Dudebro II prototype in place of SkullPro soldiers and Yetis while the final assets were still being worked on, over time the team grew attached to this pill-shaped oddity, and decided to flesh it out a bit. So here it is, with a name reminiscent of a certain character known on the Internet for being particularly fond of sticking to walls. In addition to the complex wiring and machine part placement, the inside of the Pillguy Power Suit is completely customized to fit the needs of the pilot, and guarantees comforts such as GPS navigation, Internet access with unlimited bandwidth, a selection of classic videogames, a decent supply of burgers and beer, and a coffee maker. Of course most SkullPro soldiers will also fill it up with even more junk and use up too many power outlets, thus causing a significant drop in performance and effectively cancelling all the physical advantages given by the suit. This entry was posted on Monday, November 7th, 2011 at 9:00 am	and is filed under Main News.